Sound can make you see ghosts! Normal human hearing is said to be in the range of 20 to 20,000 Hz (hertz). Too high and we tend to feel pain, too low and we appear to hear nothing. There are not too many natural sounds at the higher end of the human hearing range, but there are plenty below the range. These low-frequency sounds are called infrasound and examples include sounds made by elephants and dolphins to communicate long distances, thunderstorms and other strong weather conditions, ocean waves, whistling pipes and even trains travelling on tracks. We do not consciously hear these sounds, but they do seem to have an effect on our bodies, both physiologically and psychologically. If we consider sound as a vibrating energy then our bodies may be able to detect these vibrations without our conscious awareness. Just because the vibrations are too low for us to audibly perceive them as sound, does not mean that our bodies do not still react to these vibrations. In fact, people often report feelings of anxiety, panic or fear when exposed to infrasound. This may be explained by a natural unease to a stimulus that we are not consciously aware of; or it may also be a natural response to situations of danger, where such low-frequency sounds are common, such as thunderstorms, earthquakes etc. There is another phenomenon sometimes connected to these infrasounds… distorted vision, hallucinations and often, reported sightings of ghosts. So what is going on there? There is a story that an engineer, called Vick Tandy was working alone in a medical lab one evening in the 1980s. There were already reports that the lab was haunted. Vick reported suddenly feeling anxiety, cold and unease with a sense that he was being watched. He then noticed a grey object floating into in his peripheral vision. When he turned to look directly at it, it disappeared, as indeed did Vick, heading straight for home. Soon after, while again working in the lab, Vick noticed a clamped piece of thin metal foil was vibrating. This awakened the scientist within and he began to investigate. His investigation led to his conclusion that these vibrations were due to sound waves being bounced from wall to wall within the room and resulting in a standing wave at the centre of the room. When he measured the frequency of this sound wave it was about 19Hz, just below the range of audible human sound. Vick was also aware that this was within the frequency range within which the human eyeball resonates. He ultimately deduced that the ‘haunted’ aspect of the lab were a result of infrasound; the feelings of anxiety, cold and doom were the bodies reaction to the specific frequency of sound and the ghost sighting were an optical illusion created by the resulting vibrations of the human eyeball. The source of the infrasound? A newly installed extractor fan! Tandy used his newfound concept to investigate for low frequency sound waves in other locations, reported to be ‘haunted,’ and reported recording levels of approximately 19Hz at these other sites. Others have tried to investigate Tandy’s theory on infrasound and the paranormal. Some dispute his findings entirely; some claim it is oversimplified and other factors, such as electromagnetic fields, should be taken into account. One study tried to create a ‘haunted room’ using infrasound, but concluded that the results they recorded could be due to suggestiblity. So it would appear the jury is out on this one, science may not yet have full explained away the paranormal! However, if you ever get a spooky feeling of unease or think you have just seen something ghost like, don’t panic! It might just be your eyeballs resonating in response to some low frequency sound! 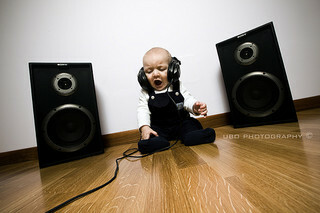 This week’s Fun Friday post is a round up of all our favourite sound experiments and facts. Hear it, make it, feel it and even see it… guaranteed for a weekend full of fun! We love this simple experiment to make a spooky sound cup… see what kind of sounds you can make with it. All you need for this one is a balloon and a radio or other music player. near the speaker of the radio. Change to a different radio station and see if the vibrations change. This one never ceases to get a WOW from everyone, and for a change Dr. How is on the other side of the camera to show how it works … click on this link to check it out. Sound waves travel in water at a speed of nearly one mile a second, which is more than four times faster than sound travels through air! Thunder is the sound made by lightning! Sound travels in air at a speed of about one mile in five seconds. If you count the seconds between seeing the lightning and hearing the thunder you can work out the distance from the source of the thunder! For example, if you count ten seconds between the lightning and the thunder then you can tell the storm is about two miles away! An echo is made when sound waves you make bounce off a solid object and travel back to your ear. Some mammals use echoes to help to navigate and to find food – this is called echolocation! Bats use echolocation to fly and hunt at night; they send out high pitched squeaks and clicks almost constantly. These sounds are called untrasonic, they are too high for humans to hear. A bat can detect an object as small as a human hair using echolocation! Does sound travel faster in warm or cold air? I was asked this by the principal of a school I was visiting during Science Week last year. I gave him the short answer… it travels faster through warm air. Technically that is correct.. it does travel faster through warm air… the molecules in the warm air are more “excited” and will vibrate more easily. Sound needs vibration in order to work so the sound is carried more easily through the air with the more excited molecules than through air with more “still” molecules (cold air). 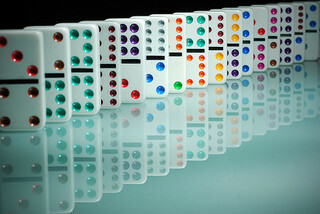 A good way to think of it is to imagine a line of dominoes. The air molecules are the dominoes. Sound makes air molecules around the source vibrate and hit off the next molecule which vibrates and hits of the next (just like the dominoes hitting off each other) and the chain keeps going until the sound reaches your ear… and then the vibrations get carried on to your middle and inner ear until they are changed to electrical pulses that are sent to the brain! And there was me thinking I was keeping this simple… back to the dominoes… just keep thinking of it like a string of dominoes. Actually that is not quite true…. for the domino model to really mimic the movement of sound you have to arrange the dominoes in concentric circles, not in straight lines. Sound travels outwards from the source in all directions. So there you have it sound does travel faster in warm air BUT it may appear to travel farther in cold air. …if the air close to the ground is colder than the air above it then sound waves travelling upwards will be bent downwards. This is called Refraction. These refracted sound waves can act to amplify the sound to someone standing far away. “Sound” about right to you? Fun Friday -making spooky sounds! 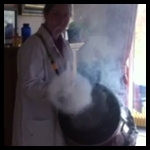 Keeping with the Halloween Science theme, this week I share a cool experiment perfect for the spooky season! Make a Spooky Sound Cup! All you need is …. 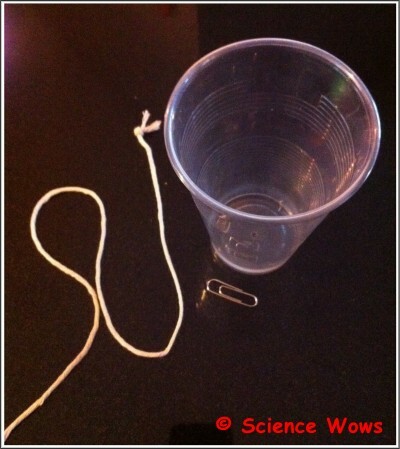 Tie the paperclip to one end of the twine. Ask an adult to make a small hole in the base of the cup, using the knife or scissors. 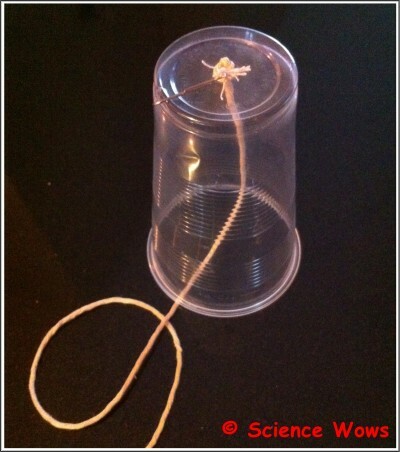 Hold the cup upside down and thread the twine through the hole. The paperclip will stop the twine from coming all the way through. Fold the kitchen paper in half and then quarter and then dip it in water. You want it wet but not dripping. Holding the cup in one hand, fold the wet kitchen paper over the twine with the other hand and hold between your thumb and first finger. Pull the wet kitchen towel down along the twine, pinching between your fingers all the time. You should notice it makes a really spooky sound. You can try this experiment without the wet kitchen paper, just wet your thumb and finger instead; Does it make a different sound? You could also see what happens if you use a different type of twine, or some ribbon, or use a larger cup! As you pull the kitchen paper down along the twine the friction between the two makes the twine vibrate. These vibrations travel through the air and bounced around the walls of the upturned cup – amplifying the vibrations so we get to hear the spooky, screechy sound! Hope you have some Spooky Fun with this experiment. Stay tuned for lots more over the Halloween Season! 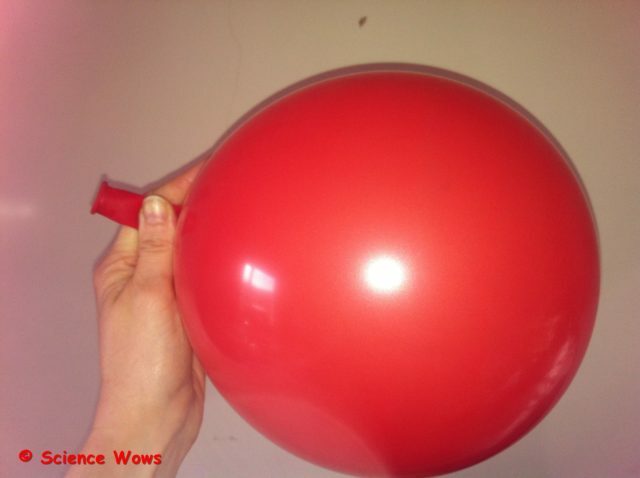 This weeks #FunFriday experiment is a simple and easy way to teach children how sound moves in air. Just follow the steps in the video… and the “big kids” among you might like the second half of the video… where I scale things up a little! When you tap the plastic it acts like a drum. The sound waves it creates make the air molecules vibrate. These vibrating molecules then make the molecules beside them vibrate. The vibrations travel through the air in the bottle and blow out the flame. Hope you enjoy this one… if you like it please share it and if you have any comments or questions I’d love to hear from you!